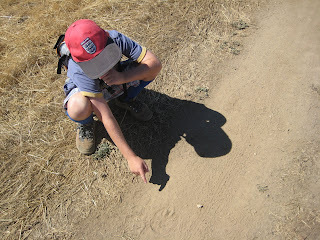 On Sunday we went for a hike up at the Russian Ridge OSP. It's part of the huge peninsular open space preserve on skyline blvd. 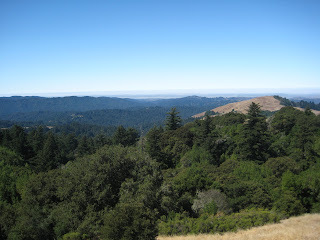 Russian Ridge is basically above Portola Redwoods - but is worlds apart in terms of landscape. This view looking westwards from the trail. Nigel and Adam had previously been to Russian Ridge with the scouts and been rained on while in the valley we had a nice day...so we were expecting it to be cool. San Jose on Saturday experienced record-breaking heat, and Sunday it was still HOT up on the ridge. Quite a substantial mountain lion print! Losing the utility room meant that I lost the space for my stacked washer/dryer. While I try not to use the dryer much I do use the washing machine almost every day and the prospect of endless trips to the laundrette was somewhat depressing. After a casual conversation with one of the contractors who said that they had previously connected washing machines on patios temporarily, Nigel and I got to work. 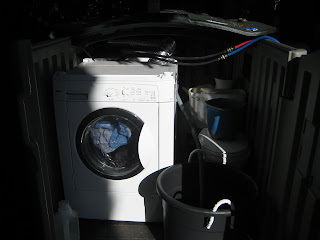 After a quick trip to Ace Hardware for hoses and an 18 gallon bucket we had created our temporary laundrette in a rubbermaid shed on the deck. 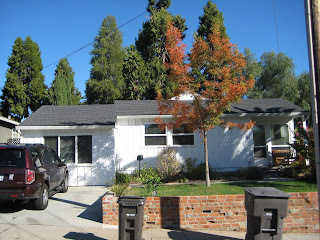 We also get the benefit of greywater for the garden while the sprinkler system is out of action due to construction. Nigel and I have been congratulating ourselves on the Heath_Robinson nature of the setup. I think that in the USA, Heath Robinson is not well known and people use the reference to McGuyver to describe this sort of cobbled-together contraption. 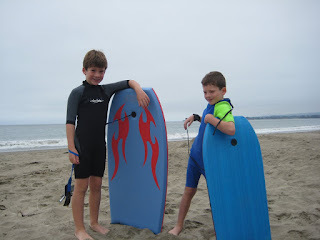 On the last day of the school holidays the boys and I went to the beach. 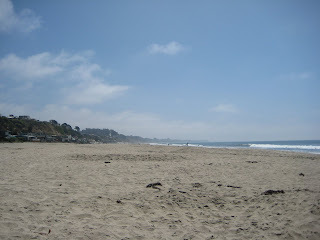 Rio del Mar beach again by popular request. We took a picnic and Adam's new skim board. They have been earning extra pocket money doing hard labour in the garden! 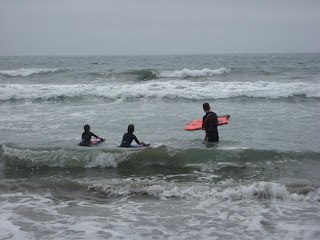 For those who have not seen one in action a skim board is like a small flat wooden surfboard. 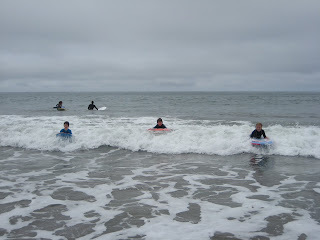 You throw it into shallow water at the water's edge, while the wave is receeding, and ride the board out on the wave. I can assure you that it's much harder than it looks! 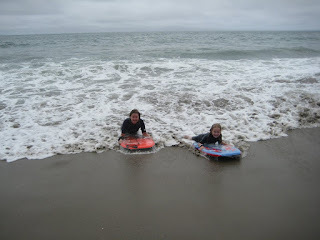 Finlay and I stuck to the boogie boards. No Sea Otters this time but there were a lot of dolphins and seals, one of which came up very close to have a look at us. I've cast on a new project. This is design number 12 from Jenny Watson's book for Noro: "Flowers". Christina sent me this book and had singled out this design as being one I would like, and it was the first one that captured my attention. The yarn is Noro Chirimen, one of the new range of Noro yarns. Chirimen is a double knit weight yarn of 60% cotton, 24% silk, 16% wool, with the typical long colour runs that Noro yarn is famed for. This yarn is colour 001 which is considered 'black, taupe, and grey', I saw a sample of another sweater knitted in this colour at Yarndogs which was predominantly black and taupe, however my sweater seems to have a lot of a lovely pistachio green and a light smoky blue as well. I'm knitting this for me, although clearly my desire for another Noro sweater outweighs my need! 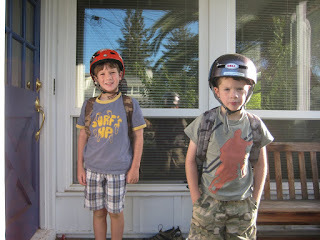 The boys headed off for the first day of first and third grade respectively. Finlay was excited about being a first grader, getting his own desk, and meeting friends, but also a bit shy about his new classroom. Adam wouldnt admit to looking forward to going back...summer holidays are much more fun! now you don't. 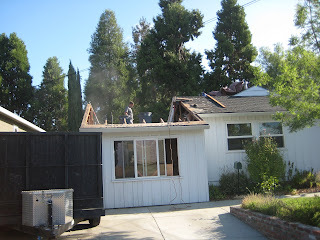 Here is our house on Day 2 of the remodeling project. The space seems very small without walls. 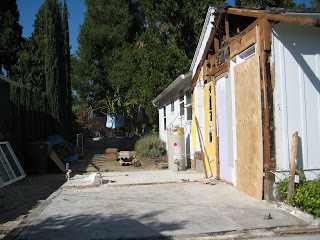 The new area that we are building on this part of the house will be nearly 400 square feet bigger. 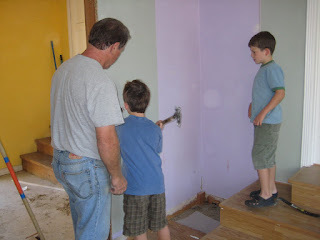 (Not really - but the contractor asked the boys yesterday if they wanted a one-time-only opportunity to bash holes in the wall with a hammer...and this is the same guy that bought his delightful border collie...so he was very popular yesterday). I don't think this skirt made it to an 'on the needles' post - but here it is...already finished. The pattern is Cat Coyle's 'Indigo Ripples' from Interweave Knits Spring 2007 issue. I knitted it in Elann Den-M-Nit cotton. The Elann yarn is similar to Rowan Denim that I have previously knitted two sweaters from. I really disliked the Rowan for it's colour bleeding and it was harsh to knit. I preferred the Elann yarn, it seemed softer, and although there was some colour bleeding onto my hands when knitting it was much less. I got gauge with 3mm needles which seemed impossibly tiny to knit a skirt, but actually it was rather a quick knit - maybe 4 weeks or so. 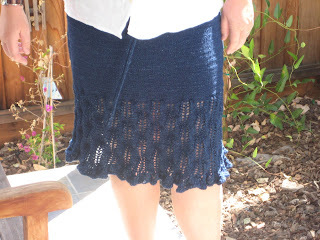 I tried to knit true to size, with the intention of wearing the skirt at my natural waist - but in fact it sits better on my hips and is a better length worn on the hips. The yarn is intended to shrink when washed and it actually shrank not only in length but also in width slightly. Before washing the skirt was 25" and after washing and going through the dryer it was 21". 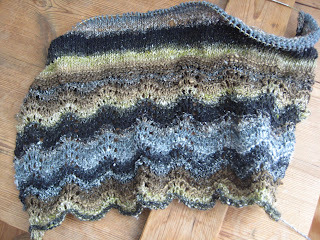 This has made the knitted fabric nice and dense and I wore the skirt today without a great deal of bagging at the seat. I did end up modifying the ruffle like Amy did to line up the feather and fan on the ruffle, but other than that knitted the skirt according to the pattern. 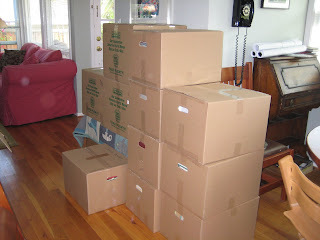 The last few weeks have been rather frenetic here at Ferretworld - more details shortly. In the meantime some photos from the last few weeks here. 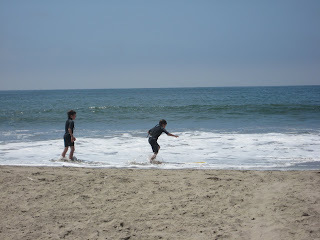 We spent our vacation close to home - mostly at the beach! We get Jules into the water! 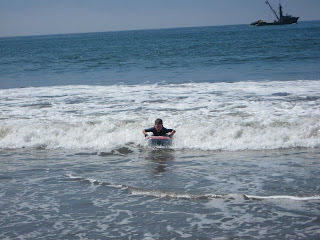 Adam just bought a skim board so I anticipate another trip to the beach in the near future! I spent last week on business in Chicago - and actually it was the most fun I've had while working for a long time. I was speaking at a conference, and I enjoyed both the conference and the venue. It was fun to be in a big city for a week. 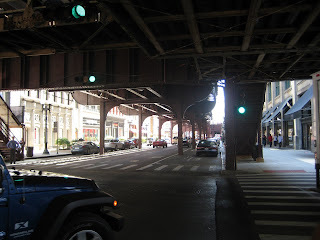 Here is a photo taken on State Street under the L (elevated railroad), it seemed a quintessentially Chicago view. Our hotel was on South Michigan Drive which is basically the main drag north/south, near several parks and close to the lake. 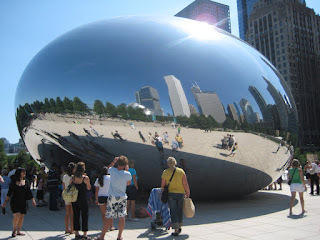 We were near the Millenium Park and I did go and see some of the sculptures including The Bean, otherwise known as Anish Kapoor's Cloud Gate, it was actually pretty great...you can see me in the green shirt taking the photo. One afternoon I skipped out and did an architecture river tour by the Chicago Institute of Architects as recommended on Ravelry. Chicago certainly seems overloaded with excellent buildings, both public and private. I especially loved the new Public Library. 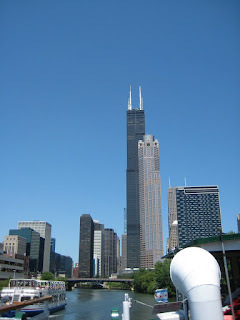 This is a view from the river of the Willis tower (formerly the Sears Tower). On the last night I went out with my team for Chicago Deep Pan pizza, which I have to say, I was not so keen on...I prefer my pizza crispy I think. However it's the local 'thing' so I had to try it. I had a nice evening and we walked back to the hotel. 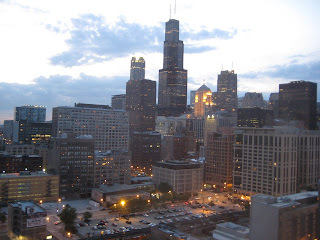 I stayed at the Chicago Hilton, and had this great view from my window. I guess a lake view would have been 'nicer' but I never get tired of looking out on the city, especially from a room with excellent soundproofing.